Solar Lobby Day – April 30th! We need your help, sign up now! 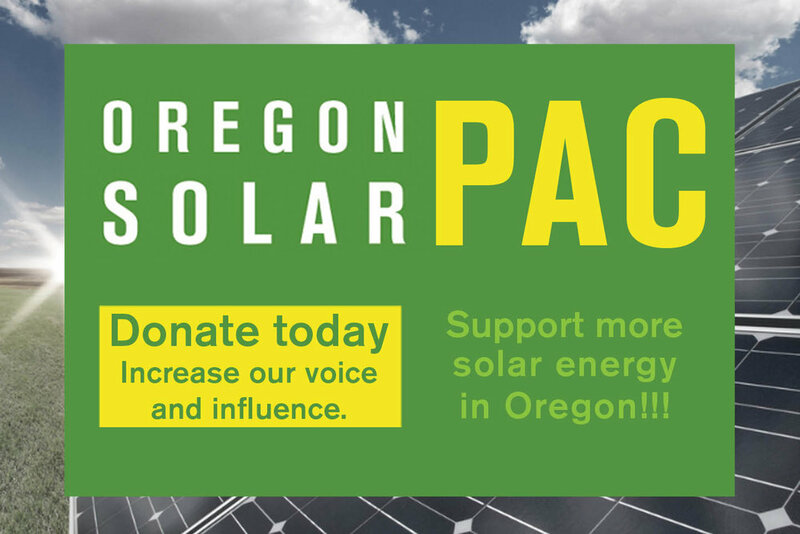 On April 30th OSEIA members will gather at the Capitol to lobby for the solar rebate, improvements to the 1.5% Green Energy Technology law and reasonable land use laws for solar. Legislators need to hear from us – sign up here. Thank you for submitting testimony in support of all the recent bills! The Capitol is a busy place right now, with the today marking the deadline for bills to be scheduled for a work session and April 9th as the deadline for all bills to pass out of the policy committee. HB 2618 is ready for a work session on Tuesday, April 2nd. We are happy to announce our newest co-sponsor, Rep. Gary Leif from Roseburg! We anticipate the House Energy and Environment Committee to adopt the -1 amendment, which adds a 15% set-aside for projects that benefit low-income ratepayers. The bill then moves to the Ways and Means committee for funding decisions. This is the hard part! We need your support at our April 30th lobby day to make the case to legislators. HB 2496 had a public hearing on March 28th in the House Energy and Environment Committee. We had great testimony and are working with other stakeholders to come to an agreement on amendments. Right now, the work session is scheduled for Tuesday, April 2nd but may be rescheduled as we continue to work on amendments. All stakeholders are in agreement on adding battery storage, but we are still working to find an enforcement mechanism that all stakeholders agree with. HB 2322 is having a public hearing and work session on Tuesday, April 2nd in House Energy and Environment Committee. Stakeholders worked on an amendment which requires the Department of Land Conservation and Development (DLCD) to update Goal 13 in order to include renewable energy. The bill requires a two-year rulemaking process and mandates that DLCD include certain stakeholders, including a renewable energy business, and consider certain issues, including community solar, in the process. OSEIA is in agreement with the amendment and supports the bill moving forward. Thank you to Renewable Northwest for their great work on this bill. Email a short note in support to hee.exhibits@oregonlegislature.gov and be sure the subject line reads – “Testimony in support of HB 2322.” Thank you! The Energy Facility Siting Council (EFSC) is known for having a slow and cumbersome process for solar developers. HB 2329 seeks to improve the process and give projects the option of working with counties instead of EFSC. Rep. Helm, the chair of the House Energy and Environment Committee is working with Renewable Northwest and the Oregon Department of Energy to find a solution. The bill is scheduled for a work session on April 9th. Thank you to Renewable Northwest and OSEIA members David Brown, Elaine Albrich and Damien Hall for their great work on this bill. HB 2494 would extend the Public Purpose Charge, the funding for the Energy Trust of Oregon, until the year 2036. OSEIA strongly supports this bill. The bill will receive a public hearing Tuesday, April 2nd. Please submit testimony that supports the ETO! Email a short note in support to hee.exhibits@oregonlegislature.gov and be sure the subject line reads – “Testimony in support of HB 2494.” Thank you! HB 3094 creates a new incentive program for energy efficiency, to replace the energy efficiency incentives that the RETC provided. The bill will receive a public hearing Tuesday, April 2nd in the House Energy and Environment Committee. Email a short note in support to hee.exhibits@oregonlegislature.gov and be sure the subject line reads – “Testimony in support of HB 3094.” Thank you!